I saw a woman on the tube today. as I listened to my music. gave her a pound without touching her fingers. her slender old frame trembling. to carry her dignity back to her. maybe I can help and heal us both. she merged into the faceless crowd. to consider what to have for my tea. did you write this? and take the photos?? This is really nice! I like the line "gave her a pound without touching her fingers." It says a lot about compassion and stigmas. I'm really enjoying your blog! I hope you keep writing and posting! Anyway, congratulations on both the poem and the photographs, which, personally, I thought had a bit of a solitary connotation too. It's amazing how you've managed to make a London Tube station (which I recognised far too quickly) look so empty. There's only a few times I've seen a tube station so empty. This is lovely - but sad. It frightens me how strong and deep the urge Is to keep your head down and walk by when you see someone in need or in trouble. I once had to wrestle with my worry and self-disgust for five minutes when I (and a street full of people) walked past a man lying on the pavement in central London. I went back to see if he was okay in the end, but the urge to ignore him was so strong it really upset me. 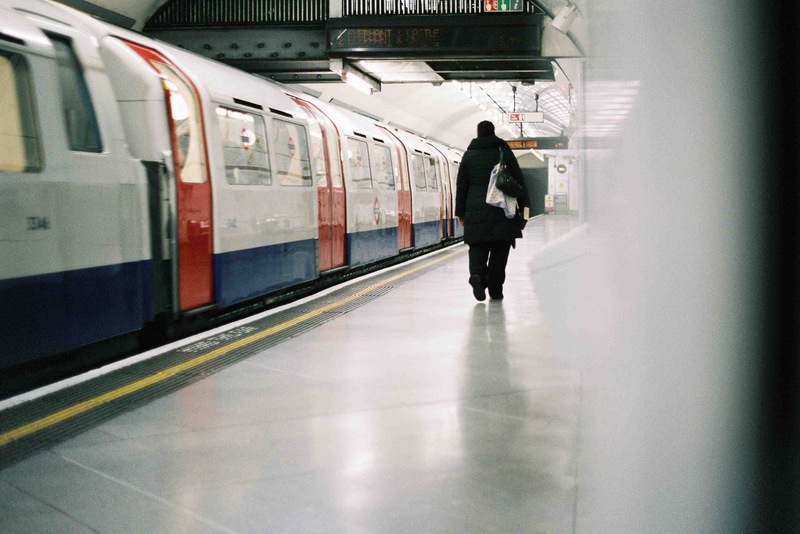 People in London, or any big city, have an extraordinary sense of self-imposed isolation. Reading up on crowd psychology and the Bystander Effect is interesting but effing scary. Off on a tangent a bit there. Great poem and lovely photos too. So I have to say, I was already a huge fan of your work on Merlin... and, um, of your face (sorry to be so shallow during the holidays). Anyway, keep posting. You're awesome. Merry Christmas! ................how are you even a real person that exists? ^this^ is awesome Eoin! Cheers! For some reason, this made me think of Yoda. "Do, or do not. There is no try." But the red doors. They speak to me. A few months ago, a young woman stopped me in the parking lot of a local store. She told me a story of an abusive relationship, being a single Mom, and she didn't have enough to get something to eat. She said she was going to be picked up and taken to a women's shelter the next day. I didn't stop to think if her story was true or not. I have been in a similar situation. My memories convinced me to help. Your words brought her memory back to me. Somehow, then, we're all connected. For at least the second time, thanks. Interesting thoughts, especially at this time of year. I live on a fairly busy street, and there are nights when I just lay there and listen to the cars go by, and reflect on how it's not only vehicles moving past-- there's at least one person in each of those machines. And, every single one of those people has a rich story to tell, a history, a future, successes, mistakes, interests, disinterests, people they've loved, people who have loved them, people they've disliked and vice-versa, hopes, dreams, disappointments... It's so easy to set that aside as I go about my day. When I'm on the road, other cars are simply other cars, and most of the time if I take note of another driver at all, it's because they've done something to worry or irritate me. When I actually stop to reflect on all of those people at night, however, it's almost overwhelming, in a really beautiful way. As for the photos, I think I like the fourth the best, both in composition and in how the single figure highlights the solitude of the otherwise empty platform. Nicely done. Someone very wise once told me that being generous meant giving more than you had; but being magnanimous meant accepting less than you need. You were generous; she was magnanimous. For a moment there, the world made sense. (May it's because I'm sick and very tired but) I'm on the verge of tears reading this. This is the story of every nameless meeting that happens everyday, when you notice someone and then they go away and you're left with regrets. And tea. Tea is very important. I'm not coherent enough to write something intelligent now, but thank you. And the photos are wonderful. Remind me of my few encounter with the Londonian metro. your poem is very touching! And so true ... we should care more for other humans! 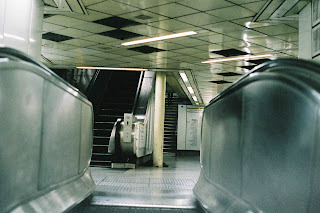 When did you take the pictures, there are no, (well okay, one person) people in the tube station?!?! Must have been very early ! that's really good Eoin, I wish I can speak better in english to explain you all my feelings about it ..
That almost makes me nostalgic for the days I used to live in London. 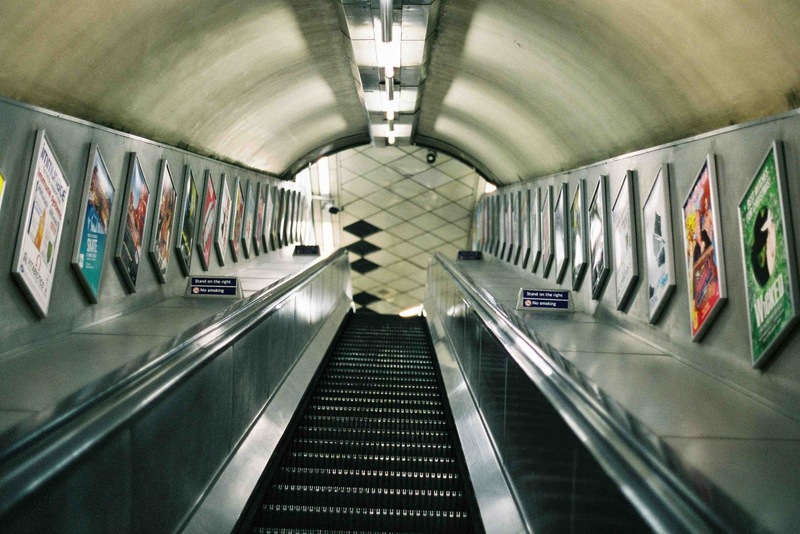 There's something about the Tube that's like nowhere else on earth, whatever mood its in. He never even looked my way. Imagining in my head he was mine, all mine. His eyes were warm and kind. Nobody stopped to ask why. Drained and withered after all her years. Then do the same to man who would never be mine. They'd think I was mad, all these people here seated. On through the journey of life. Sometimes, when we're doing something out of the norm as an act of kindness for the stranger, it's easy to see it as the 'right' thing to do. A warm smile from a stranger and a 'good morning' certainly makes my day. However, on the other hand, I'm wondering whether the woman would have really appreciated the attention? People are full of inconsistencies. Being in tears on the train once, I wanted people to ignore me. The apathy of people let me perceive them as simply people who I would never see again. My moment of weakness will simply be lost in the crowd. If someone extended their hand out of kindness, I would not know how to smile back at him with bloodshot eyes and a red puffy nose. But at the same time, I wanted people to notice me, to notice that I had suffered something to make me miserable, that the world was unfair to me. Maybe if someone did extend their hand that day, I may have felt different. Maybe I would have smiled at the memory of the kindness of strangers. But maybe I would have felt ashamed at being so weak and breaking down in front of stranger. If I leave someone on the train in misery, I feel like I've done something wrong, like I should have done something more. But that could be how the world could work. An ironic situation -where one person feel regretful over their apathy and inability to reach out of their personal space, while the other person feel grateful for it. cheers Yorkshire_Sarah that was lovely too! Thanks Julie - it's noway as good as Eoin's but it just kinda came to me so I thought oh why not! It's supposed to be from someone else's point of view on the tube but with a bit of poetic licence! ha. Love Eoin's though - you can tell it's in his blood to write. Mine was just a bit of fun, although I did enjoy writing it. There's something very intriguing about people, their actions and emotions or sometimes as it may appear, lack of them! It's such a beautiful piece of poetry. The last line hit me hard. 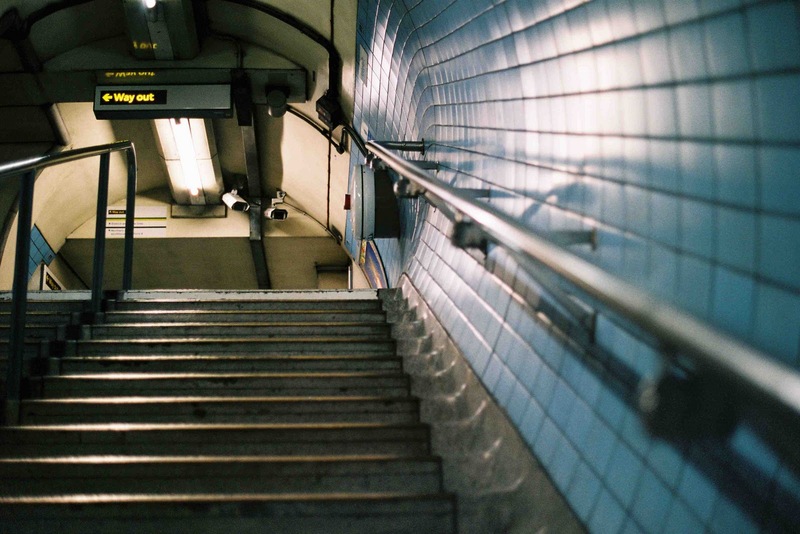 Nice photos but where did you fInd a tube station that empty?! 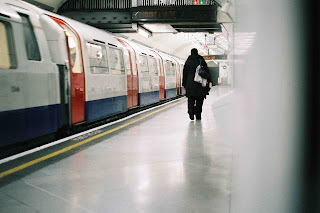 I remember running through the tube in London years ago on the way to catch a glimpse of the Reading Room of the British Museum the morning before we had to catch our flight to Paris. It was less bright than what you captured. And I remember thinking to myself, I wish I didn't have to rush through this tube. Glad to see parts of it in stills. Eoin, this made me remember a day when I was riding the London tube, trying to fight the tears that were, too, fighting, for dominance… and I was not winning that battle, not really. I remember being embarrassed, trying to be strong and not give in to the devastating pain that had taken me prisoner that day. At the time I was in tears for the most clichéd and classic reason – a broken heart. I remember that time quite vividly, because I had planned to move to London, to be in love and be happy, but fate had other plans for us. London is still the city I love and feel very much at home with! I try to get there every year, to walk the streets, to use the tube… I often experience random moments of kindness there. What I particularly liked about your observations here – your acknowledgement of the woman’s effort to hold on to her pride and your wish to “carry her dignity back to her”. Oh, something else – you were so kind as to show interest in my writing… I have to admit, you inspired me to actually start a blog of my own. I had played with the idea occasionally, but logging in here to be able to comment on yours did the trick, and I embarked on my own little adventure in blogging. Though English is not my native language, I used to write for a website about a TV series I love, Supernatural. I don’t know if you’re familiar with that, at all. What I love about that show are its roots in reality, the very human aspects of the story despite the paranormal riff raff. I’d be honoured if you found time to look at some of this. Thank you for inviting me to share these links with you, Eoin. I hope you have a blessed Christmas with your loved ones. That was beautiful, the poem and the photos too. I used to use the tube daily in my other life and you learn not to notice the other people in your carriage, I hated that it's considered weird to make eye contact or speak to your fellow passengers. The only time that ever changed was maybe 20 years ago, the train broke down and we were trapped in the carriage with only emergency lights for about half an hour. Those of us who were standing sat down on the floor of the carriage and everyone just talked and talked and talked. It was amazing, until the lights came back on, the train started moving and we got to the next station and everyone got out and went on with their lives. tweeted you about my reply poem, only to then discover that you get about 6,000 mentions on twitter every day by adoring fangirls. nothing much, but something. your little poem obviously inspired me. thanks for that, eoin! Rule number one - never, ever delete something just because its controversial. We need more controversy in this world, and it has to be stuff we can admire people for bringing up. I just read your short story, I'd subscribed by RSS so it was there even though you'd deleted it. I can see why it may have offended people, be it fictional or not. It didnt offend me personally and I don't think you should have given in to the bullying and taken it down. You are as free to express yourself however you wish, the same way others do. The fact that you're in the public eye shouldn't change that right. My only comment would be that maybe you shouldn't have countered on twitter with an attack on fanfiction. Those that are involved in the fanfic community are passionate about their right to write whatever they wish, even when the original creators of whatever universe they're writing about have asked them not to (sometimes nicely, sometimes through C&D letters). You're never going to win in an arguement with them and you're probably just going to antagonise a massive community of Merlin fanfic writers. I say put it back up. Those that are offended by it are already offended, they're already telling all their friends that you're a homophobic douche or whatever, so having removed it wont change that, the only thing it does is show that you're easily manipulated. I get that you care what people think and you didnt mean to offend anyone but I think you should stick to your guns, if you thought it was good enough to post then you should leave it there for people to judge. i agree with pie-liner and jael, put the story back up. not just because i want to read it, but because you should never back down from your art. if it was just fiction, then let it be out there. the only words we should ever resind are those intended to hurt others. it doesn't sound like (from here and twitter) that you had any intentions of hurting or upsetting anyone. You put words on what I feel when I see someone sad and I can't help because I don't have the force to do it. I experience this, in a slightly different way, on a daily basis. I cannot understand why humanity doesn't truly care for it's own kind. We see these people in need, and though we might feel the need to help, that feeling is not strong enough because we move on with our lives regardless. I don't care if I sound like some Miss America contestant when I say that I wish everyone could get the help they deserve. This is so lonely. And so real. That's what I really love about your writing; you're never afraid to cut through all the crap we use to protect our egos and display the truth of this gritty world. No, we aren't usually very kind to those we don't know, especially "undesirables." We long to connect to someone, anyone, and yet we let so many opportunities pass because someone isn't good enough or normal enough or they just aren't enough. Everyone, alone together. Wow. That was rather a cynical reply. I do apologize, my cynicism frequently manages to slip loose of the cage I keep it in. A misunderstood misanthropic actor/film maker/writer type who probably has a greater sense of self worth than he should whilst simultaneously having a deep sense of self loathing, coupled with an optimism for the future and a paradoxical senseless love for humanity.